The amygdala is a small limbic system structure in the brain. It is implicated in a number of disorders. An unusually small size has been linked with attention problems particularly in boys. This almond shaped structure is also tied to our ability to regulate our emotions, interact with others and recognize their emotional states. Over 3000 people with and without ADHD participated in one of the largest brain scan studies on Attention Deficit Hyperactivity Disorder or ADHD. Dutch scientists found five areas of the brain were smaller in individuals with ADHD when compared to the control group. The good news is that the brain size differences were greater in children and lessened as they matured into adults. This indicates that children can outgrow the effects of ADHD. The volumes of the accumbens, amygdala, caudate, hippocampus, putamen, and intracranial volume were smaller in individuals with ADHD compared with controls in the mega-analysis. Exploratory lifespan modeling suggested a delay of maturation and a delay of degeneration, as effect sizes were highest in most subgroups of children (<15 years) versus adults. Disorders of the amygdala, an almond shaped structure in the limbic system, contribute to emotional disturbances. New research indicates that it may be affecting boys more than girls. This is important because boys and men are diagnosed with ADHD almost three times as often as girls and women. During their lifetimes, 12.9 percent of men will be diagnosed with an attention disorders. Just 4.9 percent of women have a diagnosis of attention deficit hyperactivity disorder or ADHD. If one retrieves two memories around the same time, those memories become linked. 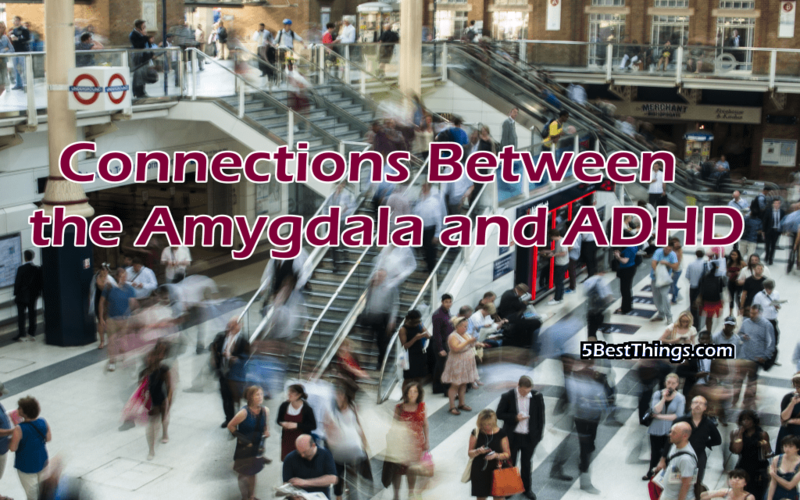 The amygdal is part of the connector for emotion related memories, like a happy birthday party followed by a frightening movie. Memory traces for two independent emotional memories in the brain partially overlapped when the two memories were retrieved synchronously to create a linkage. Suppressing the activity of the overlapping memory trace interrupted the linkage without damaging the original memories. Many of us deal with stress all the time but severe and prolonged stress can cause depression, anxiety and cognitive dysfunctions. A recent study showed that an enriched environment allows us to better deal with stresses and encourages brain plasticity or growth and development. A colorful, interesting environment also seems to improve the symptoms of depression, ADHD and Alzheimer’s disease. The environment that we spend a lot of time in influences our level of anxiety, spatial learning and memory impairments. To encourage learning, emotional calm and memory take care of your amygdala. Get enough sleep. Eliminate stress where you can. Create an enjoyable environment for yourself and get out into nature every once in a while.